The 2018 Dodge Durango SRT is a powerful SUV with a wide range of features, which is why it is a popular model at our dealership. We are confident that you will be pleased with all the 2018 model has to offer. If you want to find out more about the features that come with the 2018 Dodge Durango SRT on Long Island NY, stop by Security Dodge. We are an authorized Dodge dealership on Long Island NY serving Long Island Westbury Massapequa Amityville NY. For now, you can read about its interior, exterior, mechanical, powertrain, and safety features below. The exterior features on this trim include a bumper and grille that are more bold than the lower Durango trims, and it also comes with two vents that extract heat, a functional scoop, and body-colored lower valances. In addition, standard 20-inch matte-black wheels are also included with this trim. The exterior color lineup includes three stunning shades of gray, white and Octane Red. The all-season tires come standard, but you can opt for the Pirelli P Zero Run Flat summer tires for additional exterior appeal. There is an optional sunroof that provides everyone in the cabin with fresh air, and rain-sensing windshield wipers are also standard with this trim. To see its safety features for yourself, test drive the 2018 Dodge Durango SRT on Long Island NY at our dealership. Leather sport seats, second-row captain chairs, and third-row seats are offered with this model, which provide you with a contemporary cabin. In addition, there is also a flat-bottomed steering wheel and sporty interior trimmings are found throughout the cabin. 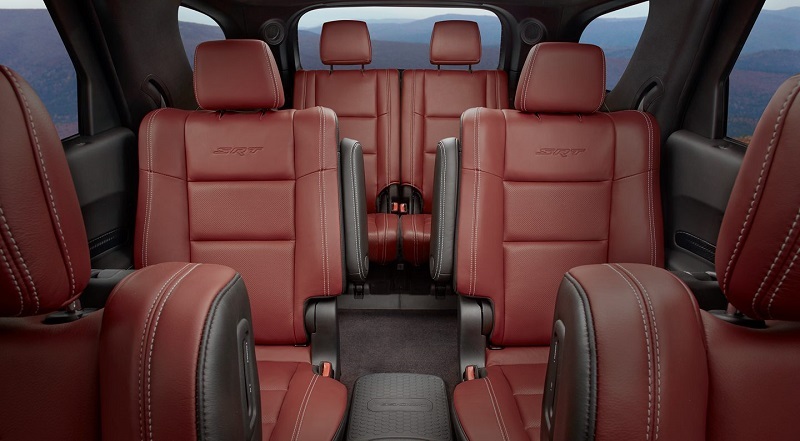 The first- and second-row seats are heated, and the front seats are also ventilated for superior comfort. In addition, power adjustments are offered with the front seats, and the third-row seats provide much more space than other models in its class. You can opt for the Interior Appearance Package, which includes black leatherette and white stitching on the gauge cluster and dashboard that is typically seen in luxury SUVs. This package also features genuine carbon-fiber trim as well as a microsuede headliner. The 2018 model comes with a Uconnect infotainment system that is paired with a large 8.4-inch touchscreen. This infotainment system can support Apple CarPlay and Android Auto. You can easily connect to Siri and Apple Music with your iPhone or Google Maps, Google Now, and Google Music with your Android. In addition, the Uconnect system also offers navigation and SiriusXM Travel Link. One major difference between this trim and the lower trims of the Durango is the Performance Pages menu. The SRT comes with this feature that enables you to monitor horsepower, acceleration-time statistics, cornering G-force, and other data that keeps you informed about its performance. 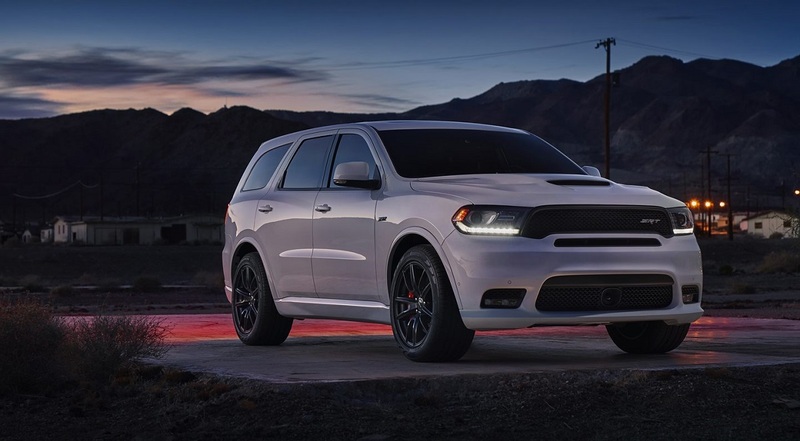 If you want to request additional information about the 2018 Dodge Durango SRT on Long Island NY, visit Security Dodge and speak with one of our SRT experts. 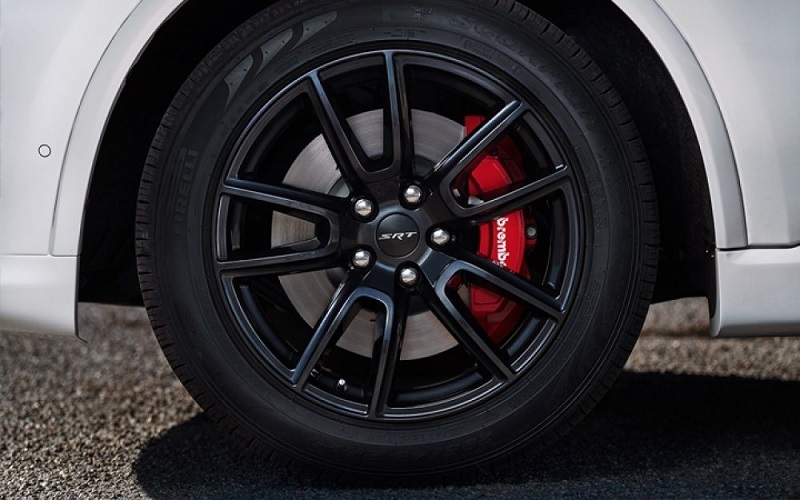 The 2018 model comes with Brembo brakes that feature six-piston calipers in the front and four-piston units in the back. This feature helps the Durango come to a stop at 70 mph in only 167 feet, which is quite impressive for an SUV that weighs 5,369 pounds. The transmission that comes with this trim features a Driver Selectable Mode as well as Sequential Shift Control. With the Driver Selectable Mode, you can choose seven modes to meet your preference: Street, Sport, Valet, Eco, Tow, Track, and Snow. It also comes equipped with a 700CCA maintenance-free battery with run down protection, a 220 amp alternator, towing with Trailer Sway Control, and Bilstein shock absorbers. This trim received a five star rating for its engine and transmission from Car and Driver. It comes with a 6.4L HEMI V8 engine known as the 392, which is reminiscent of the 392-cubic-inch HEMI engine that was seen in the muscle cars of the 1950s. The engine housed in this trim can produce 475 horsepower with 470 pounds-per-feet of torque. In addition, it has the best towing capacity in its class of 8,700 pounds. The engine is paired with a TorqueFlite eight-speed automatic transmission that maximizes shift points and provides you with optimal torque. Our authorized Dodge dealership on Long Island NY can get you behind the wheel of a 2018 Dodge Durango SRT for a test drive. Not only does this trim provide you with superior power and outstanding performance, it also offers the most advanced safety features in the automotive industry. With this trim you get active safety features that include a Blind Spot Monitoring System, a ParkView Rear Back Up Camera, ParkSense Rear Park Assist, and ParkSense Front and Rear Assist, and Adaptive Cruise Control. Another notable feature is Rain Brake Support that eliminates water from the brake pads by using pressure from the caliper. In addition, this feature also automatically engages the windshield wipers in the LO or HI position. 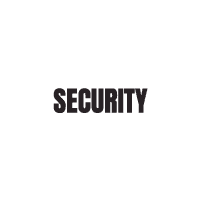 It also offers SiriusXM Guardian that can automatically lock and unlock the doors and will send a notification to your cellular phone if the theft alarm is activated. This feature also uses Stolen Vehicle Assistance to help law enforcement locate the SUV if its stolen. Now that you’ve read about what the SRT has to offer, visit us at Security Dodge serving Long Island Westbury Massapequa Amityville NY. 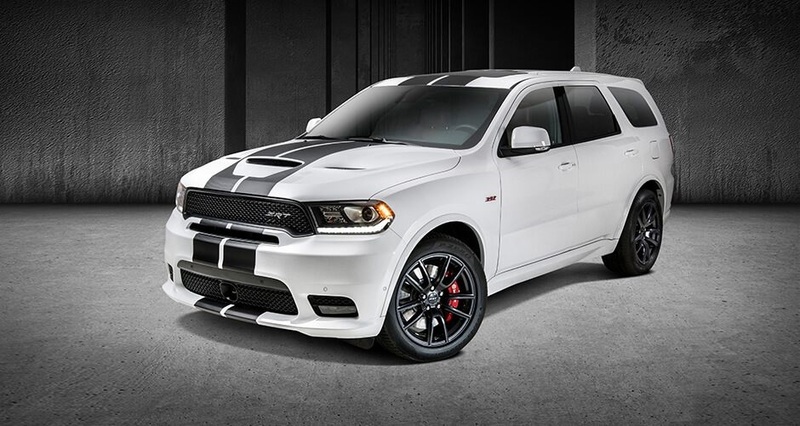 Our authorized Dodge dealership serving Long Island Westbury Massapequa Amityville NY on Long Island NY can provide you with further details about the 2018 Dodge Durango SRT.